Don’t worry… you won’t need to climb this… unless you get lost… as I did! Even the altitude of the route doesn’t go above 100m, you will find a lot of steep hills. 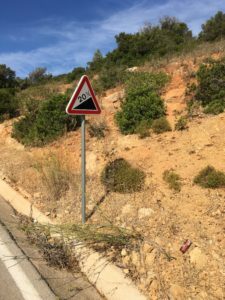 Wind and rough terrain could cause you further trouble, for this reason it’s advised to take some training on hilly roads or in your favorite gym. Your bike – or you can rent one here. Set for patching tires and spare tube, pump, basic tools for tuning. Flashing light: especially if you are cycling in late autumn or winter, days are pretty short so the sunset comes quickly. Sun cream and sun glasses – especially if traveling in Summer! Don’t forget your swimsuit: you’ll be crossing so many wonderful beaches! GPS, maps and guides – see here.